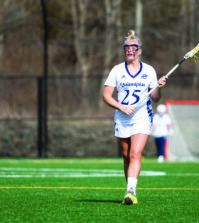 When Kelly Babstock entered the TD Bank Sports Center Friday night, she was tied with Ohio State’s Laura McIntosh for the nation’s lead in points. When she left, she not only registered her first career hat trick but also led the nation in scoring. McIntosh had two assists in the Buckeyes 5-3 loss to Minnesota State and now has 23 points, while Babstock, with the hat trick, has 24. 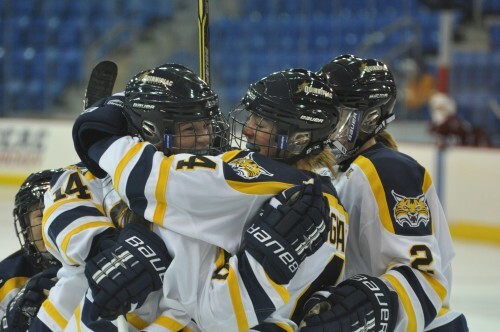 The Bobcats (8-4-1, 3-3 ECAC) took an early 1-0 lead on Chelsea Illchuk’s first period goal. From then on, it was all Bobcats, scoring three more times in the second period to seal the 4-1 win over Harvard (2-2-1, 2-2-1 ECAC). The second period was the Kelly Babstock show. She scored all three Bobcat goals in the period. It started just under two minutes into the second period. Jordan Elkins’ shot from the point hit a Crimson body and bounced around in front of the crease. Babstock found it and put it into the open net. Babstock struck again just five minutes later. After a faceoff in the Bobcats end, the Bobcats raced up ice and created a 2-on-1. After the initial shot from Kate Wheeler was stopped by Bellamy, she let a rebound out and a scrub ensued in front of the Harvard net. Babsock found the puck and stuffed it just inside the left post. The hat trick was completed with just less than three minutes left in the period. She received a pass from Wheeler just inside the blue line and skated in on Bellamy. Babstock deked Bellamy out of position and stuffed the puck into the right side of the net. 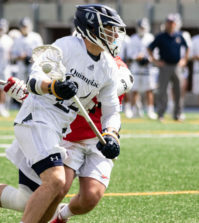 “Everything that coach said I did and it happened to score goals,’ Babstock said. Seeley was not surprised that Babstock scored a hat trick or is number one in scoring. “A good team, bad team, doesn’t matter. She shows up,” Seeley said. Babstock’s hat trick forced the Crimson to make a change. They pulled Bellamy in favor of Lauren Joarnt to start the third. And it didn’t take long for the Crimson to respond. Whittney Kennedy found a loose puck inside the right face circle and wristed it past Victoria Vigilanti and into the top-left corner. But that would be all that the Crimson would get, as Vigilanti stopped 27 of the 28 shots fired at her. Babstock hopes to remain near the top spot in scoring for awhile. The win is the Bobcats second straight over Harvard after losing the previous nine.